A highly regarded sculptor of granite was shot to death at a 1903 meeting of socialists in Vermont. 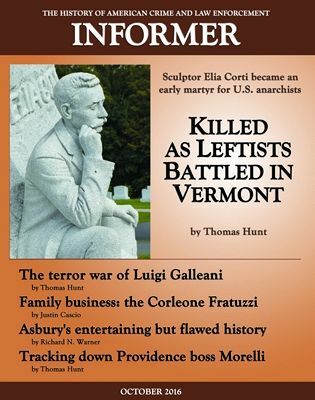 Elia Corti joined a growing list of martyrs to the radical leftist cause of anarchism, championed by Vermont-based newspaper editor Luigi Galleani. A short time after the death of Corti, followers of Galleani engaged in a war of terror against leading figures of capitalism and the government of the United States. The little-remembered fight involved government abuses of individual rights, wholesale deportations of foreigners deemed to be threats and a series of anarchist bombings that climaxed with a deadly explosion on Wall Street. In this issue, Thomas Hunt looks at the Corti killing (Link) and the anarchists’ conflict with the U.S. (Link). Historian/genealogist Justin Cascio explores 100 years of family links among the leaders of the Corleone, Sicily, Mafia and its U.S. Mafia offshoots. (Link). Book review and notes (Link). In ‘The Warner Files,’ Richard N. Warner discusses the entertaining but flawed history told by Herbert Asbury (Link). In ‘Just One More Thing,’ Thomas Hunt tries to track down elusive Providence, Rhode Island, boss Frank ‘Butsey” Morelli (Link). 48 pages including covers and nine pages of advertisements.